Paper boxes are great fun to make and can be adapted in a variety of ways. This simple folded box is made from two sheets of square paper and can be made in various sizes depending on the size of the paper you use. Simply follow the step-by-step tutorial and you'll have a cute folded box. These make great gift boxes and are also perfect for party or wedding favors. 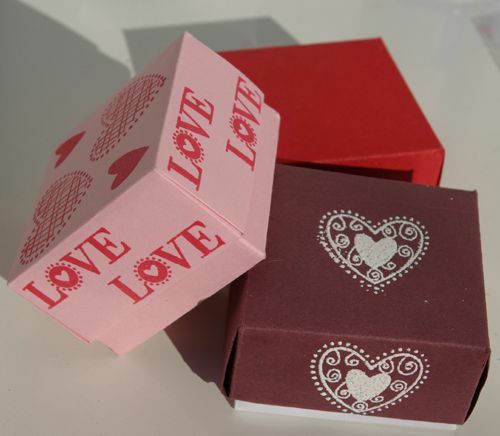 You can also customize the boxes with rubber stamps and other embellishments if you like. This is a clever design for a box that can be adapted to any size of square. You'll start by making the lid, then repeat the folds with a smaller piece of paper to make the base. The top, sides, bottom and even the inserts for the inside can all be stamped. Any sized paper can be used as long as it is a square. The finished box will always end up a quarter of the size of the original square when measured from corner to corner. Practice on scrap paper and keep any finished boxes to try different rubber stamp positions and techniques. Begin with any size square of paper or cardstock. Draw two lines diagonally from corner to corner. This will form a large X, marking the center of the square. Don´t worry about marking the paper as the marks will be on the inside and therefore will not be seen. As you begin to fold the paper, try using a bone folder tool to help make a crisp fold. This will give you a great quality finish. In turn, fold each corner into the center of the square. Be careful when folding the third and fourth corners not to fold to the wrong line. You want the corner's point to stretch to the opposite side of the square. Fold the first corner to the line that the first fold made on the opposite side. At this point, you should be seeing a series of squares created by the various folds. You will now need to finish that off with one last set of folds. Fold each corner to meet the nearest fold line. Make four cuts as indicated in the picture. It makes no difference which corners are used as long as they are opposite each other. Now is the best time to stamp the box. Remember to leave enough time for the ink to dry before completing the box. With your paper decorated, you're ready to fold the box. A dab of glue will help hold the folds in place, however, this is not essential. Fold the two corners without cuts into the center. Fold the same edges up as shown to form two of the sides of the box. Fold the cut ends in at either end of the box. Fold the two remaining pieces into the middle of the box. This will securely hold the box together and there is no need to add glue. With the lid complete, you can now make a base for the box in exactly the same way. However, this time you will cut the square a fraction smaller so the base will fit into the lid. Finish the box with stamping or embossing on the outside if you like. Try adding stamped embellishments, or stamp some ribbon and tie it into rosettes to top the boxes.